Founded in New South Wales over thirty years ago, Bambi has long since helped Australian families sleep well under our southern skies. Always looking to new innovations in bedding, Bambi has now created the Tencel Touch fibre range – for one of the most comfortable and hypo-allergenic ranges around. 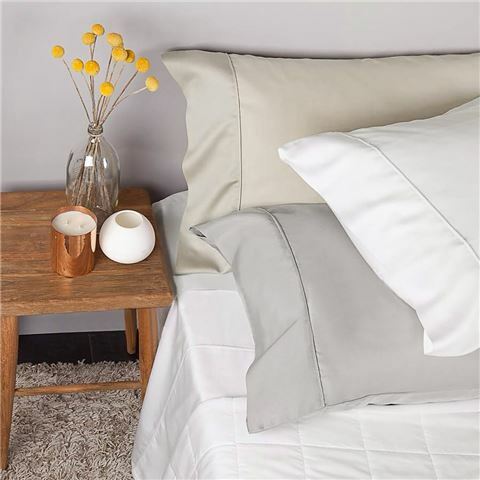 The luxurious fabric used to make these sheets is derived from plantation eucalyptus fibre, which provides a silky-smooth finish and is great for those with allergies, as it is also naturally anti-bacterial. It’s also known for its high moisture dispersion properties; helping you to remain comfortable throughout the night. With an optimal breathability thread count and eco-friendly nature, Tencel Touch is waiting to wrap you up comfortably and soundly. Made from the award-winning new-age fibre Tencel. It's fully biodegradable, silky smooth, anti-bacterial and easy to care. Eco-friendly, natural fibres with natural moisture dispersion. Mega-sized skirt for deeper mattresses. Presented as a set of four. Flat Sheet – 280cm (l) x 275cm (w). Fitted Sheet – 205cm (l) x 185cm (w) + 50cm. 2 x Pillowcases – 76cm (l) x 50cm (w).